This perfect union of Jesus’ human nature and his divine nature was necessary for him to fill the office of mediator between God and man (1 Timothy 2:5). The Bible passage that blends these two realities together beautifully is John 1, especially verse 14, “The Word became flesh and dwelt among us. 1. Provides the means for Jesus, the Son of God, to die. 2. Provides the means for Jesus to personally know our infirmities. 3. Provides the means for Jesus to live before us so that we may follow him. 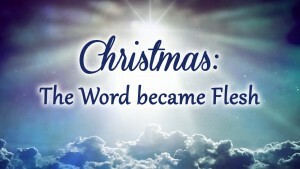 The Word became flesh. The very one who spoke all things into existence is now flesh. John’s gospel account reveals so many powerful transformational words of Jesus. · “Go, your son will live.” (John 4:46-54) Miles away, the man’s son is healed. · “Get up, take up your bed and walk.” (John 5:8) The lame man is healed at Bethesda. · Jesus gives thanks for 2 fish and 5 barley loaves. (John 6:11) Thousands are fed with the meager meal. · “I do not condemn you; go, and sin no more.” (John 8:10-11) A sinful woman is forgiven and saved. · “Lazarus, come forth.” (John 11:43) Lazarus is raised from the dead and walks out of his tomb. 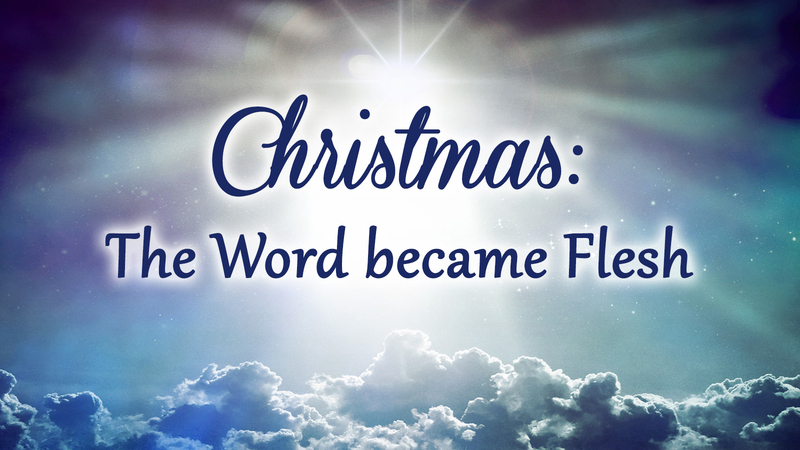 On Christmas morning, God became incarnate, temporarily dwelling in the flesh of mankind. God “fixed his tent of flesh” for 33 years to dwell among us. The reference takes us back to Israel’s redemption from Egyptian slavery when God dwelt among them in the tabernacle. The tabernacle foreshadowed what began at Christmas when God dwelt among us. 1. The tabernacle was intentionally temporary. The Son of Man did not take up residence on earth. 2. The tabernacle was for the wilderness. Jesus tabernacling among us depicted a life on the move in order to establish what is eternally permanent. 3. The tabernacle was intentionally plain and unattractive. Jesus came without pomp, and his birth was so common and unroyal that Israel saw little reason to give attention to him. 4. The tabernacle was God’s dwelling with mankind. Jesus tabernacled with us—it was in Jesus that mankind witnessed the glory of God. 6. The tabernacle was the place of sacrifices. Jesus became the sacrificial Lamb. We have seen his glory. One of the great wonders and mysteries of the Nativity is that Jesus, the Son of God, became a man without ceasing to be the glorious God. 1. Contemplate the divine glory of Jesus. 2. Recall the glorious character of Jesus. 3. Consider the moral glory of Jesus—full of grace and truth. To experience the glory of God, you are going to receive God’s grace by embracing his truth.